Uncle Joe was short of stature - five foot two (5’ 2”). He was very knowledgeable, a wonderful musician. 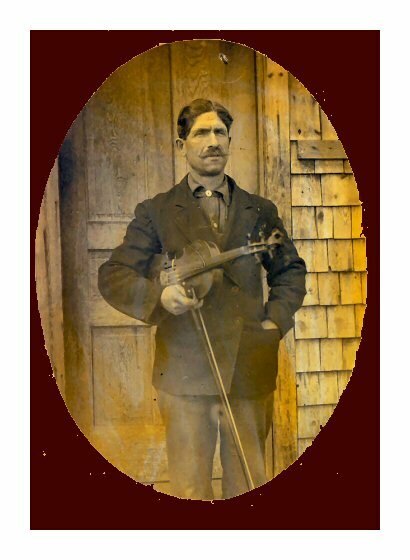 He played many instruments, reed organ, violin, and banjo. He sang a beautiful bass. He remembered many quaint songs from his Canadian childhood. There was one really sad one about a little boy who was tying leaves to a tree. Asked what he was doing he replied, “I’m tying the leaves so they won’t come down, so sister won’t go away.” The verses told the story how the doctor came to sister and he heard the doctor tell his mother that his sister would go up to heaven when the leave fell in the fall. He would play the song on our reed organ (at my request). I would hide behind the draps and cry. Whe I told Uncle Joe how I hated to play a song with sharps he taught me how to transpose to flats. He was proud of his French heritage and alway introduced himself as Joseph Napolean La Fleur. Never owned a car, walked everywhere he went. Workded for mnay years at the Latter Ranch - walked three miles one way for a dollar a day and his lunch. Never missed a church meeting - later years walked a mile each way. He took his job as church Santa Claus seriously. Had a long speech prepared. Every kid knew the fort fat little Santa was Uncle Joe and we wished he’d forget the speech and get on with the gifts. He was so good for all of us country children. During testimony time he used big words. We could hardly wait to get home and loo them up in the dictionary. I remember one nigh he said, “The weather was very inclement today”. We looked at each other with question marks in our eyes. What kind of weather is that? He would get a after the young folks and then would say, “And that goes for my neice Arbutus also, setting there at the organ.” As if everyone didn’t know who I was. His back would be to the crowd and I could see them laughing behind their song books but I knew I’d better keep a sober face. He had a full head of iron grey hair and at times wore a goatee. Always neatly dressed. Uncle Joe broke male tradition as his grandfather, father and two brothers were blacksmiths. One of his first job in Michigan was driving the buggy for a prominent judge in AuSable Oscoda. Joseph was baptized Catholic in Canada, joined the Methodist Episcopal Church in Ashland, Wisconsin. Also Glennie. Became a Baptist, one of Curtisville Baptist’s most loval members. Copyright © 1998-2018, Curtisville Civic Association. All rights reserved.